Imagine if Mario Andretti offered to give you driving lessons. Imagine if Eric Clapton wanted to teach you how to play the guitar. Imagine Eddy Merckx tagging along with you to races and offering up the knowledge gained from his countless victories. Imagine the same hands that built the frames, which carried the greatest stars of cycling to glory in the ’80’s and ‘90’s built one for you. Although doubtful that you’ll be driving with Mario, jamming with the Slowhand or hanging out with the Cannibal, having Dario Pegoretti build a frame worthy of a Tour de France champion – just for you – is entirely within reach. As a frame builder, Dario Pegoretti completely defies the mold. He is part scientist, part engineer, part artisan, and 100% passionate artist. In the beginning of his career he was a contract builder, making frames for the major Italian brands when they needed batches of custom bikes for the professional teams they sponsored. It was extremely rewarding work for Dario, and he was proud to know that so many professionals were on bikes that he had touched. Ever imaginative, the master builder started to watch the guys as they rode and began collecting feedback from them. For il maestro, good enough isn’t motivating, so he started working with tubing manufacturers like Columbus and Dedacciai to develop better solutions for the frames he wanted to create. He rejected the notion of standard geometries and sought to design frames that were specific to the type of material he was using, the shape of each tube, and the kind of rider that it would carry. He further defied Italian tradition by moving away from lugs and embracing TIG welding. The result is that each frame to come out of Dario’s small, music-filled shop is a true, highly informed and custom work of art--a work of art that’s meant to be ridden and enjoyed on the types of roads that make all of our hearts beat fast. 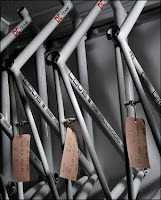 Of course we love Dario and his frames and regularly order as many as we can pay for. We're also one of only two teams that he's ever sponsored! The result is that we generally have six to 10 Pegoretti masterpieces in stock at any given time. Over the next week, we’ll show you the batch that are currently in our care. If you like one you see, drop us a note, we’d love to build it up just for you.